Christmas is coming closer and closer. Would you go for any Christmas party or throw a party yourself? This Smoked Salmon Salad could be a good choice for party snack, or just have it as an ordinary day’s side dish. This salad went very well with the pan-fried lamb steak I cooked the other day. The choice of baby greens for this salad is quite flexible that you can use any veggies you like. The colours of this snack really caught my family’s eyes. Best of all, I could prepare this salad on the go, or make it in advance, pop it in the fridge, and grab it out to enjoy in the last minute. Keep me free enough to enjoy chatting with my family and friends. Rinse baby greens, drain well and wipe dry with paper towels. Mix well with seasonings. Taste by yourself and adjust to your liking. Scatter half of capsicum and green onion over the baby greens. 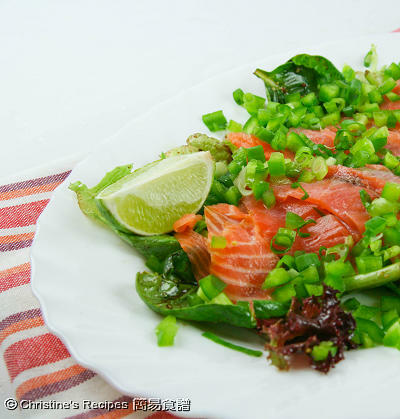 Arrange smoked salmon on top of the greens. Scatter over remaining capsicum, green onion. Drizzle over lime juice and some more olive oil. Season to taste. Cover and refrigerate for 30 to 45 minutes. Serve smoked salmon with toasted bread. You're most welcome. We've got many fresh salmon here. Can make you salmon salad, salmon rice, salmon sushi and .....anything with salmon you like, LOL. Simple, yet so pretty. Looks delicious! What a fantastic idea! I live so close to the fish markets here and have access to really fresh and beautiful salmon - this dish looks like it could really bring out the best flavours of the fish! 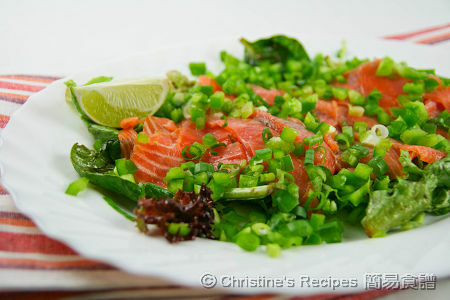 I love smoked salmon - this salad sounds so wonderful and refreshing. The colours are fantastic! Very very festive. Simple and delicious! Smoked salmon always taste great! Love em in salads. I love the colors of this salad. It is so inviting ! Oh look at the colour of this dish!! This is perfect for our X;mas lunch down under! The salad looks fantastic and so colourful! Smoked salmon is one my favorite things to eat and this looks like such a simple, beautiful presentation that doesn't take away from the flavour. Wow, that looks very delicious, refreshing and healthy. I would love to try that but I think I'll use poached salmon instead. The salad looks so appetising, salmon is one of my favourites. Healthy and nutritious too! the smoked salmon does look even better in that salad. healthy and delicious! yumm! Oh yes, this is what we call it fresh salad! No kidding!